The words “Mid-Century Modern” are everywhere. From Crate & Barrel to Craigslist, Sotheby’s to Walmart, Mid-Century Modern or MCM is the sought-after style for life today. What is it about kidney-shaped pools and steel beams, polished concrete and plate glass, womb chairs, and spider legs that continues to fascinate after all these years? Looking at the works of Richard Neutra and Charles and Ray Eames this talk will explore the competing visions of Mid-Century Modern in California. 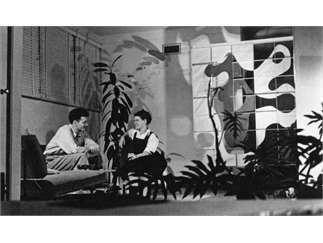 Image: Charles and Ray Eames in their apartment designed by Richard Neutra, early 1940s.